Just steps from Wirksworth's town centre, tucked away on a quiet cul de sac, is this surprisingly spacious semi detached family home, complete with two parking spaces and gardens front and rear. The home offers three generous double bedrooms, a family bathroom and potential en-suite, extended kitchen/utility, sitting room and dining room with french doors out to the private back garden. Viewings highly recommended on this one! Location - The property stands on a quiet cul de sac just a short stroll from Wirksworth town centre. Wirksworth offers a good variety of shops, restaurants, pubs and cafes, and a lively arts and social scene including the famous Arts Festival. There are medical facilities and good schools nearby, and excellent transport links including regular bus services, trains from nearby Cromford, and you can even catch a steam train to Duffield on the Ecclesbourne Valley Railway on special occasions! The Derbyshire Dales offer beautiful countryside walks and cycle rides, and nearby Carsington Water has water sports, walks and wildlife. A short drive takes you to the Peak District National Park. Entrance Hall - 3.68m x 1.89m max (12'0" x 6'2" max) - With stairs up to the first floor , and a useful under stairs storage cupboard. Doors off to sitting and dining rooms. Sitting Room - 3.68m x 3.45m (12'0" x 11'3") - A cosy room with a coal effect gas fire set in a marble surround and regency style mantelpiece. The front window faces west to catch the evening sun. Kitchen Extension - 3.91m x 2.18m (12'9" x 7'1") - This room really expands the kitchen space, and provides ample room for appliances. Units and flooring match the kitchen, and there is a breakfast bar under the side window. Spaces and connections for under counter fridge and freezer, washing machine and tumble dryer. A half glazed uPVC door leads to the driveway. Landing - With doors off to bedrooms two and three, bathroom and study. Bedroom Two - 3.70m x 3.49m (12'1" x 11'5") - A front facing double room. Bedroom Three - 3.46m x 3.35m (11'4" x 10'11") - A rear facing double room with lovely views. Bathroom - 2.22m x 1.88m (7'3" x 6'2") - The bathroom has a striking black and white theme, with white octagonal suite and black and white tiles with silver accents. There is a mixer shower and folding glass screen over the bath. The floor is black and white tile, and a tall linen cupboard is tucked in the corner. Bedroom One - 5.07m x 4.50m max (16'7" x 14'9" max) - A light and spacious room, with two large velux windows and a small side window. Gorgeous views from here! There is ample eaves storage, as well as a large built in wardrobe at each side of the bed. A built in shelf at the head of the bed is a clutter-free alternative to side tables. Walk In Wardrobe / Potential En Suite - 1.75m x 1.60m max (5'8" x 5'2" max) - Currently a storage space, this self contained room has a velux window. 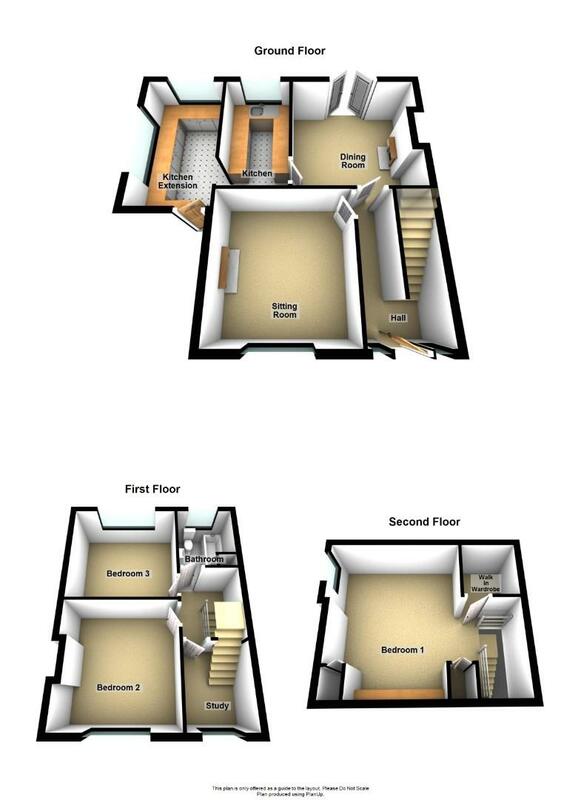 We understand that the vendor installed plumbing and electrical connections for an en-suite at the time the loft space was converted. Given that the adjoining master bedroom has ample storage elsewhere, conversion of this room to an en suite is well worth considering! Driveway - At the side of the property is a gravelled drive, giving side by side parking for two vehicles. A gate gives access to the rear garden. Front Garden - A low stone wall surrounds a good sized front garden, which has the potential to be converted to extra parking if required. A low timber gate opens from the street into the paved and gravelled garden with low maintenance slate beds, giving access to the front and side doors of the property. Rear Garden - The french doors in the dining room open onto a private patio garden with stone paving and low maintenance planting, fully enclosed by a lovely old stone wall over which can be seen mature trees, hilltops and St Mary's church tower. There is also access to the driveway via a side gate, and the timber shed is included in the sale. Property Notes - We understand that the property was built in the 1950s. In the early 2000s the vendor installed new uPVC double glazed windows and doors, built the kitchen extension and converted the loft. The property benefits from mains gas central heating throughout, and has wired in smoke alarms. Council Tax - We are informed by Derbyshire Dales District Council that the property is in Band B, which is currently £1486 per annum. Directions - From Wirksworth Town Centre, head down St Johns Street (B5023) and take the second left onto Wood Street (by the church). At the end of Wood Street turn left onto Nether Gardens, and the property is located at the end of the cul de sac, on the right. There is also a footpath from Nether Gardens which links up with St Mary's Gate, and Church Walk, taking you to the centre of town.